Immerse yourself in these superb examples of Italian gardens in the Renaissance style – a true treasure trove for the passionate gardener, but also a unique experience for one who only loves to look at flowers and architecture. The price is based on the current exchange rate of the Euro vs. the Dollar (Jan 2017) i.e. any cost increases caused by a weakening dollar shall have to be passed along to client. Fly from US airports to Milano, Italy. Meet our representative and transfer by private bus to Bisuschio (Varese area) Meet the guide and visit of Villa Cicogna Mozzoni, built during the Renaissance. The house is U-shaped and open on the two sides to a perfect Italian garden witha stone wall in the back (sim. to Florence Castle caves). 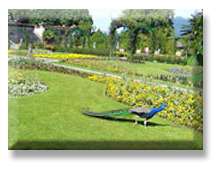 After the visit travel to Laveno Mombello and visit a private garden. The park covers 7 hectars, the lake providing an unparalleled view of Stresa and the Borromean Islands framed by mountains. You can see an endless variety of rare plant species. 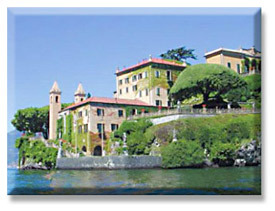 EVE - Then travel towards Lake Maggiore for your hotel. Accommodation at Hotel Montelage very good 3 * hotel in Ternate – ideally located between the two major lakes. Dinner at hotel . 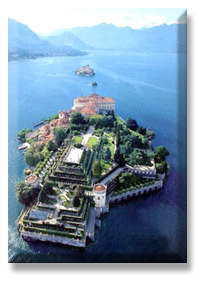 AM - Departure to Stresa on Lago Maggiore by private bus to visit the islands of the lake. Meet your guide and board the boat to Isola Bella. 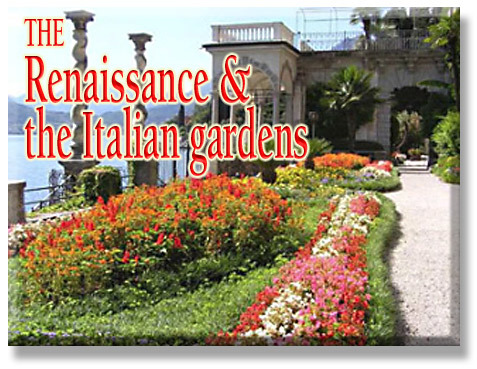 Visit the baroque palace (built in 1632) and the world famous Italian gardens. 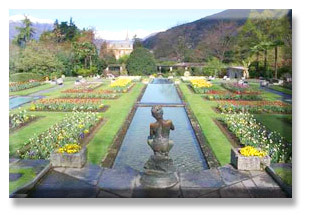 The gardens are laid out over a series of ornate and overlapping terraces, a classic example of seventeenth century "Italian gardens". Then the tour goes on to the Isola Pescatori (Fisherman Island). It is occupied almost entirely by an ancient rustic village with typical narrowstreets. Lunch at local restaurant. PM - In the afternoon departure to Isola Madre, the largest of the Borromean Islands. Its gardens, where all manner of peacocks, parrots and pheasants roam freely, are full of rare plants and exotic flowers, helping to create the charm of a tropical land. 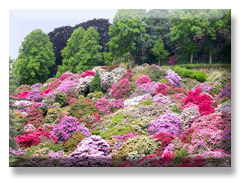 Isola Madre is particularly famous for its azalea, rhododendron, and camellia blossoms and also for rare specimen such as a spectacular Kashmir cypress and palm Jubaeae Spectabilis that reached the venerable age of 125. EVE - Return to Stresa by boat and bus to the hotel. Dinner at hotel. AM - Departure towards western shore of Lago di Como. Arrival in Cernobbio. 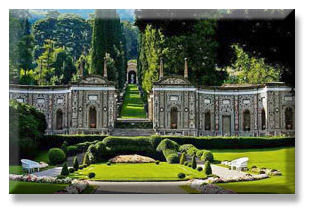 Meet the guide and visit the beautiful park of famous Villa D’Este, The design of the lower part of the gardens is from the Renaissance period. The two most outstanding landmarks are the 500 year old plane tree and the 16th century Mosaic with its Nympheum. Apart from the topiary hedges and the bushes of bamboo, azaleas, camellias, oleanders, rhododendrons, hydrangeas, there are roses and jasmine bushes. The trees range from chestnut, magnolia, oleafragrans, wisteria, palm, cypress, pine, ilex, privet, mediar to many others.Lunchin a local taverna. 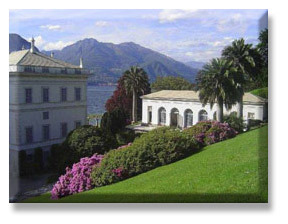 PM - In the afternoon departure to Lenno to visit the splendid Villa Balbianello (now owned by FAI, Environment Fund). 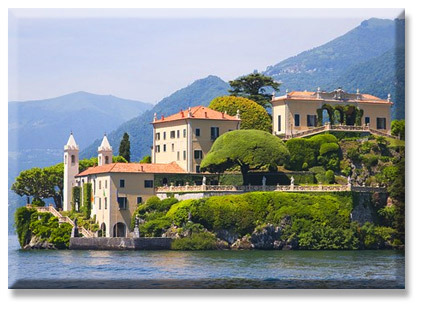 Built for the Cardinal Angelo Maria Durini in the late eighteenth century, the villa stands on a promontory overlooking Lake Como, almost opposite Bellagio. The real masterpiece is the panoramic terraced garden dominated by the elegant loggia with three arches which stands on the highest point of the promontory. After the visit the tour goes on to Tremezzo, where you can admire the splendid Villa Carlotta, a place of rare beauty, where the master piece of nature and art live together in perfect harmony: the rock garden, the valley of ferns, the forest of rhododendrons, the garden of bamboo and many others. EVE - Return to the hotel and dinner. 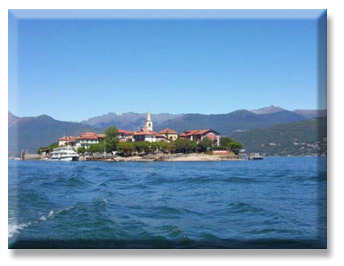 AM - Departure by private bus to Verbania (western shore of Lago Maggiore). Meet the guide and visit Villa San Remigio. Discover the park of the villa means to dive into a world of charm evocative and deep emotions. Within its walls a series of Italian terraces, a hortus conclusus, an English garden and a wooded area, all harmonising with the surrounding landscape. At the end the tour will go on to Villa Taranto.So explained Captain Neil Mc Eacharn, the man who created these marvellous gardens. Many thousands of plants, brought from the far corners of the world, and rare collections, some of them unique in Europe and acclimatized after long laborious efforts, have been arranged with art in this beautiful setting, between the mountains and the lake.Lunch on own. 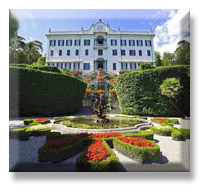 PM - In the afternoon departure to Stresa and visit the beautiful park of Villa Pallavicino created in 1800. 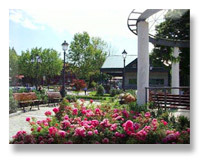 The park occupies an area of 20 hectares between bloomed, trees and a beautiful botanical garden. The main attraction of the park consists of the animals. You can observe more than 40 species of exotic birds and mammals (llamas, kangaroos, zebras, flamingos), who live in wide open spaces. EVE - Return to the hotel for dinner. AM - Departure by private bus to the eastern shore of Lago di Como. Arrival in Varenna. Meet the guide and visit Villa Monastero. A balcony with a breathtaking view over the lake, a lush botanical garden abounding in exotic plants, a house adorned with eclectic decorations and architecture. This is Villa Monastero. Initially an ancient Cistercian monastery, later a patrician residence, today the villa is a house-museum where both the interior and the gardens are open to visitors. At the end departure to Bellagio. PM - Lunch in a local restaurant. 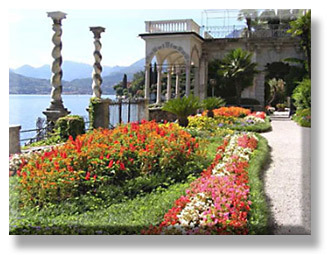 In the afternoon visit the gardens of Villa Serbelloni, a large park in which winds over 18 km of paths and trails that often offer a panoramic view of the lake leaving enchanted by the beauty and grandeur. Then transfer to Villa Melzi. 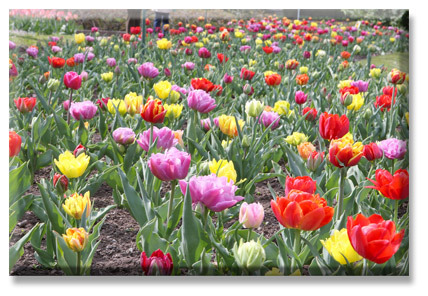 Visit the park which was built between 1811 and 1815; the first example of English garden made on the lake. Apparently the natural distribution of plants was the result of extensive studies to enhance the illusion of backgrounds and distances. EVE - Back to the hotel. Dinner and overnight. AM - Check out of hotel and depart to Milan airport for flight back to the USA. PUBLISHED BY HERZERL TOURS ON JAN. 31, 2017 - changes may be made to the program, if deemed necessary by tour operator - tour prices are based on exchange rate at time of publication and may be changed if necessary.